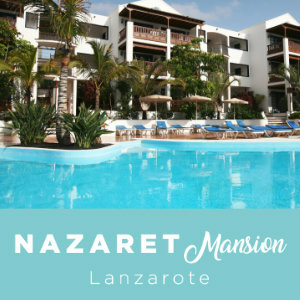 Nazaret Apartments and Nazaret Mansion are ideal for those who want to enjoy a few days of the privileged environment of the island of Lanzarote. Nazaret Hotels are two apartment complexes for holidaymakers in Costa Teguise, Lanzarote. They provide comfortable accommodation by the sea. The company’s first project was Nazaret Apartments, and a few years later, Nazaret Mansion was built. Today, these two complexes are interconnected and share facilities managed by the same staff. Nazaret Hotels is the project of a 100% Lanzarote company, that’s why the buildings represent, in body and soul, the island, its people, its history, its architecture, with its shapes and colours and with the people who are part of the company. Staying with us is to live in authentic surroundings, to enjoy and to take a bit of Lanzarote with you. Built to Canarian design, and each with its own style, Nazaret Apartments and Nazaret Mansion are two complexes located in the centre of Costa Teguise. The place is really peaceful and harmonious and it is only 100 metres away from beaches, the marina, bus stops, taxi ranks, supermarkets, restaurants, and more. 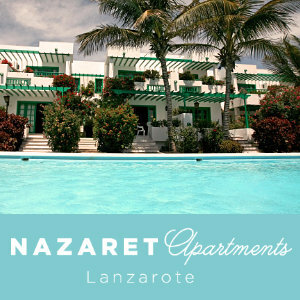 Nazaret Apartments was built in the typical Lanzarote style created by the artist Cesar Manrique. The architecture is characterised by simple cubic shapes, white walls and green doors. Actually, Nazaret has always stood out with its flowery balconies and terraces. Nazaret Mansion embodies the pure Canarian colonial style. The furniture in the apartments of the Mansion was made by local handicraftsmen with noble woods, inspired by the stately homes of the archipelago. We are more than glad to help you before and during your holidays. Please do not hesitate to ask us about our accommodation or activities and recommendations to have a great time during your stay. Visiting Lanzarote is a unique experience. We offer the possibility to enjoy spaces where art and nature live together in perfect harmony. We make sure that your stay at Nazaret Apartments and at Nazaret Mansion is the most comfortable and agreeable possible so you have some real time off.